Growth regulators – We do not use Growth regulators. 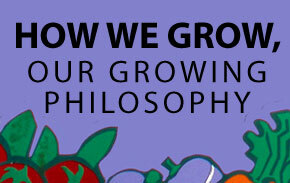 Growth regulators cause premature blooms, stunted growth, and premature aging of the plants. Growth regulators are used to shortcut the growing process and benefit the grower, shipper, and blacktop outlet stores keep their plants during their handling of the plants but do not benefit the final customer. Our plants are allowed to grow and Bloom Naturally and the result is a more vigorous plant with Larger blooms. Growth regulators are mainly used for shipping purposes to keep foliage smaller and it can take many weeks for this chemical to dissapate from the plant so the plant remains small and unchanged during your growing season never reaching its full potential. Far more important than the use organic product is to not have PGR chemicals introduced into your plants prior to purchasing. We keep our plants cleaned and free of dead foliage to reduce fungus issues that might occur and natural trimming to make for more natural growth. These practices we follow make our job harder and your end result larger and more prolific and have been done since we opened in 1962.